September 15, 2009, Stow, Massachusetts, The Collings Foundation will put on its third annual World War II Reenactment, Veteran's roundtable discussion and fall open house. Picture this, an undercover Resistance Fighter met with the Allied Forces and showed the exact coordinates of the German encampment. The night before an elite German force over took a small grass airstrip just a few hundred feet away. The Allied Forces had to gain control of this airfield so they could fly in much-needed supplies. - It was going to be a tough fight. There were German machine gun nests set up all over the camp perimeter and the dreaded 88mm Cannon was pointed to the sky waiting for the Allied bombers to fly overhead. Another menace was the German Stuka Dive Bomber aircraft lurking in the sky. The Allies knew they needed a lot of firepower. The commanding officer called in two tanks (a Sherman and Chaffee), troop carriers, jeeps, lots of ammo and a M16 half-track with quad mount .50 caliber machine guns. Over fifty Allied troops made their way through the forest hoping to surprise the Germans. Just when they were getting ready to attack - a German Fiesler Storch reconnaissance aircraft spotted the troops! They opened fire on the Storch, but it was too late. The plane made a quick turn from a practical standstill and landed at the German camp. The pilot alerted the German unit of the advancing Allies. The Allied soldiers knew – it was now or never! How will the battle end? Will the Allied troops be able to gain control of the airfield and further their advancement? You will have to be here to find out. 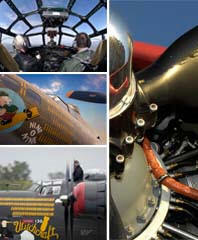 The Collings Foundation will host a Living History event you will never forget. You will be able to see original equipment from WWII in action. Everything from the cooking utensils to M1 rifles is original. This will be the only event of this type - in the world. The World War II reenactments and open house takes place over the weekend of October 10th and 11th, 8:30 AM to 4:30 PM at the Foundation’s Headquarters, 137 Barton Road, Stow MA.